A couple of months ago I posted my first bread recipe. It came from the book ‘Going Paleo’ from Pete Evans. 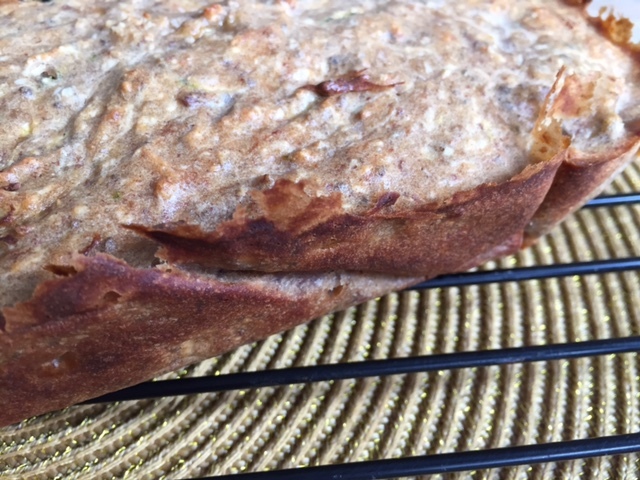 His Paleo bread, with almonds and eggs as the base, is packed with protein and healthy fats. 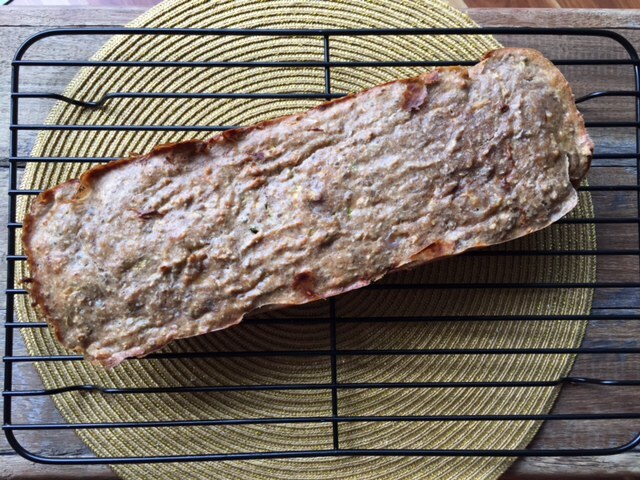 Since then making a loaf of delicious grain free bread has been a weekly ritual – it’s become a real replacement for conventional bread. With the rise of low carb, gluten free and increasingly paleo diets more of us are giving up or restricting conventional bread. 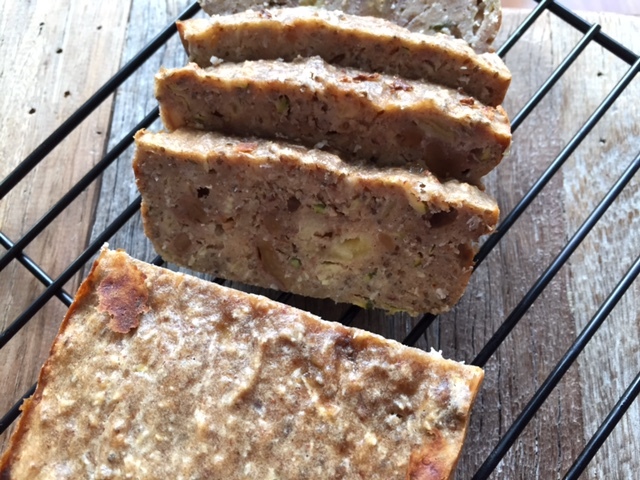 So here I wanted to share another healthy gluten free twist on a popular type of bread – banana bread. 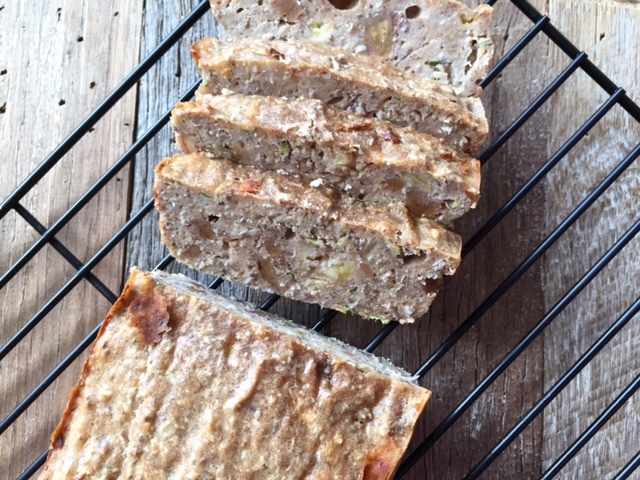 This banana bread is more of a sweet treat that comes in handy for afternoon tea, or it can save the day in the face of post dinner dessert munchies. 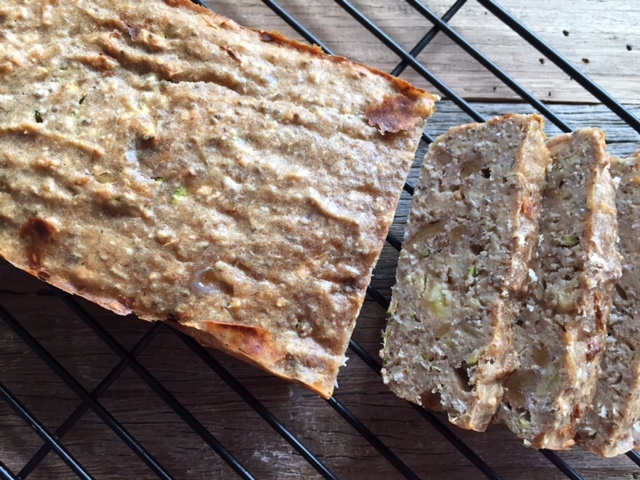 As you’ll see from the ingredients this recipe is full of healthy ingredients and contains more protein and healthy fats (and far less sugar and carbs) than standard banana bread. And don’t be put off because walnuts aren’t your go to nut – the walnuts aren’t essential. I simply had a big batch that needed to be used. But you could easily substitute another type of nut like pecans for example. Replace the zucchini with 1/4 cup of extra desiccated coconut. To make a paleo version replace the flour with a second cup of almond meal. Substitute the walnuts with other nuts or even flaxseeds. Optional – add 1/2 tsp of vanilla extract. Grease a loaf tin with a little butter or oil and line it with baking paper. And pre-heat the oven to 180C. Sift the almond meal and flour into a large bowl and then add the whisked eggs. Add the nut butter, coconut oil and vinegar to the bowl and then combine everything into a smooth batter. Toast the walnuts in the oven for 5 minutes or so and then crush them into chunky pieces. While the walnuts are cooking mush the bananas until you have a smooth paste like consistency. Add the final ingredients into the batter (bananas, chia seeds, coconut, zucchini, walnuts and cinnamon). Carefully fold everything together with a large spoon or spatula to avoid knocking out too much air. Transfer the batter into the lined loaf tin, using the spoon or spatula to create an even surface. Bake at 180C for 30mins or until a skewer inserted comes away clean. Remove from the oven and once cool transfer the loaf to a wire rack. Eat immediately or within 24 hours. Or slice and transfer a portion to the freezer for future feasting. Tags: almond meal, banana, bread, gluten free, healthy, no sugar, nuts, paleo. Bookmark the permalink. Love it! 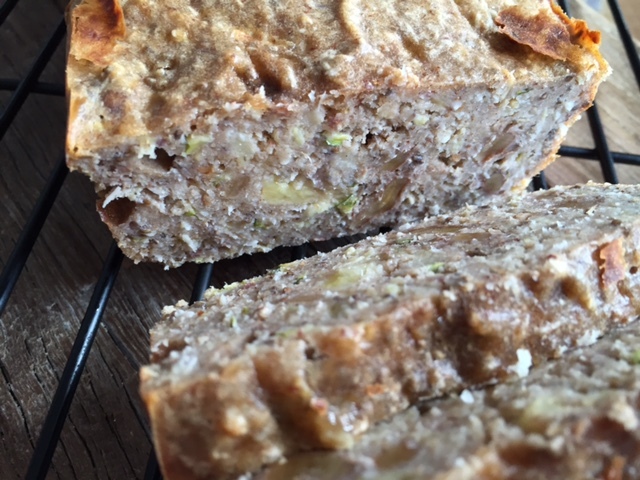 You can’t go wrong with a nice hot slice of banana bread.